Inequality, Health Disparities, & Obesity – Patrick F. Clarkin, Ph.D.
An October poll of 1,000 likely voters found that Americans are increasingly concerned about income inequality. When asked: “How Big a Problem is Income Inequality in the US?,” the majority (74%) replied that it was either a big problem or somewhat of a problem. Predictably, there were differences in opinion by political ideology, but a majority of liberals (94%), moderates (81%), and conservatives (55%) answered that inequality was at least somewhat problematic. However, as is true of many polls, it was not specified exactly what people found unsettling about it. I suppose there are many reasons that people might find increasing inequality (and climbing rates of poverty) to be troubling, but I wanted to focus here on inequality and health, particularly on obesity. First, what do we mean by poverty? I remember watching an interview on PBS with the economist Jeffrey Sachs years ago (transcript here – thank you, Google), where he distinguished between two types of poverty. The first was an extreme form, which he called the type of “poverty that kills.” The other type was more of a poverty of inconvenience or jealousy. I don’t want to over-interpret Sachs’ meaning. It was a passing phrase in an interview from ten years ago, and his primary focus was on alleviating the extreme poverty faced by more than a billion people in the world living on $1 per day (see Sachs 2005). Elsewhere, Sachs has lamented that the media have ignored poverty in the United States at a time when “the U.S. has the greatest income inequality, highest per capita prison population and worst health conditions of all high-income countries.” His credentials in fighting poverty are unassailable. But I cite the old interview here because I think his descriptions (‘poverty that kills’ vs. ‘poverty of jealousy’) might resonate with many people today, and not necessarily in a good way. The perception that poverty in higher-income countries is a condition of jealousy or inconvenience is reinforced (wrongly) by many epidemiological studies showing that obesity rates are highest among the poor, particularly for women and children (Sobal and Stunkard 1989; Miech et al 2006). This version of poverty is obviously less urgent than the severe undernutrition, stress, and infection faced by people living in extreme poverty, but that unfortunately means that it is often downplayed simply because it doesn’t conform to someone’s mental image of poverty as abject destitution. It is also unfortunate because obesity is often seen as a condition of affluence, and caused by ‘sloth’ or ‘gluttony’ (Prentice and Jebb 1995). Gluttony and sloth, of course, are not value-neutral terms, and there is a tendency to blame the victim if their body mass index crosses some rather arbitrary threshold that demarcates an adult as overweight or obese (25 or 30 kg/m2, respectively). However, there are many reasons to think that the causes of obesity lie at least partly outside of individual choices, and are influenced by larger social forces. To be blunt, poverty is a political football that people kick in whatever direction helps validate their worldview. (That’s understandable; we all have biases. If you think you’re an exception, I humbly suggest that you look again). To Robert Rector, a Senior Research Fellow at the conservative Heritage Foundation, the hardships faced by the poor in the U.S. are real, but they are grossly exaggerated because of the material possessions they own, and because “most of the poor do not experience hunger or food shortages.” Besides, Rector wrote, “the collapse of marriage and erosion of the work ethic are the principal long-term causes of poverty,” suggesting those in poverty have only themselves to blame. In agreement with this idea would be Republican Presidential candidate Herman Cain, who stated “Don’t blame Wall Street. Don’t blame the big banks. If you don’t have a job and you are not rich, blame yourself!” On the other side of the political spectrum, Senator Bernie Sanders (I-VT) asked “Is poverty a death sentence in the U.S.?” It is. On the other hand, wealthy people die too. Life itself is a death sentence (though beautiful nonetheless). I don’t think we’re going to get very far from listening to pundits and politicians who point fingers and give overly simplistic opinions masquerading as explanations for complex phenomena. A better approach is to look at what the data say about exactly how harmful poverty is in the U.S. How harmful is obesity? What are the links between the two? How much disparity in health, wealth, and life expectancy can a society tolerate? And how can these things be ameliorated? Right from the start, I think we can immediately refute the notion that poverty in higher income countries is just about jealousy or materialistic envy. 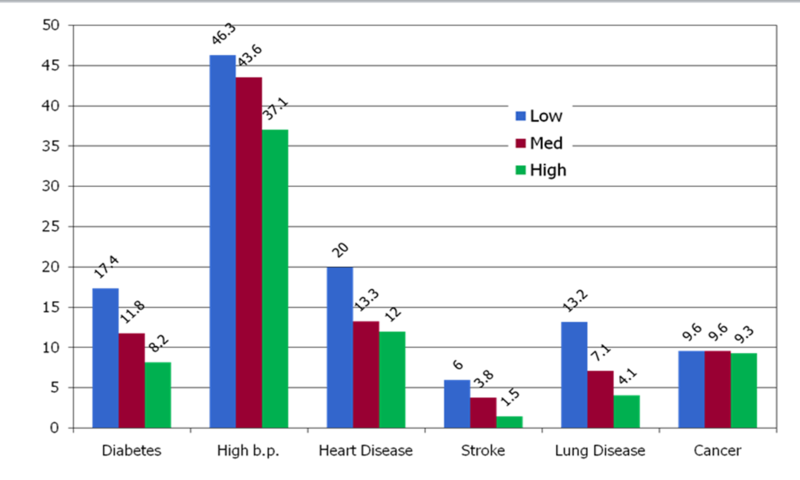 Epidemiological data from the U.S. and Britain consistently show that compared to wealthier segments of society, the lowest socioeconomic strata have higher rates of various illnesses, including diabetes, cardiovascular disease, and lung disease (Banks et al 2006). Logically, these disparities translate into gaps in life expectancy such that in the year 2000 the wealthiest Americans could expect to live an extra 4.5 years from birth than the most deprived (Singh and Siahpush 2006). In addition, that gap has been widening in recent decades, and when one incorporates ethnicity and geography into the analysis the gaps widen even further. Christopher Murray and colleagues (2006) argued that the epidemiological data show that there are “eight Americas,” with the biggest gap in life expectancy being an astounding 21 years between the 3.4 million urban black males and the 5.6 million Asian females in the U.S.1 That’s a lot of life years. There are fewer things more fundamental than how much time one gets to spend on the planet, not to mention the quality of those years. Furthermore, there is good evidence that inequality itself, and not merely gross national income per person, is harmful to health and social problems (Pickett and Wilkinson 2007). Therefore, it is highly misleading to claim that poverty in developed nations is just about envy. Frankly, if your argument is that all poor people really lack is “richness of spirit,” then you’ve forfeited your credibility (if you had any to begin with) and you should lose your seat at the grown-ups table. How does obesity fit into this? Rates of obesity are increasing globally, and this is no longer confined to wealthy countries (Balkau et al 2007), but the association between socioeconomic status (SES) and weight is complex. Monteiro et al (2004) demonstrated that the burden of obesity shifted to low SES strata when a country reaches the “upper-middle income” threshold, defined as a GNP of about $3,000 – 9,000 per capita. For the lowest income countries (GNP of < $735/ capita), obesity rates are highest among the wealthy; in higher income countries the opposite is true, and the poor are more likely to be obese. However, this national-level approach is too broad. 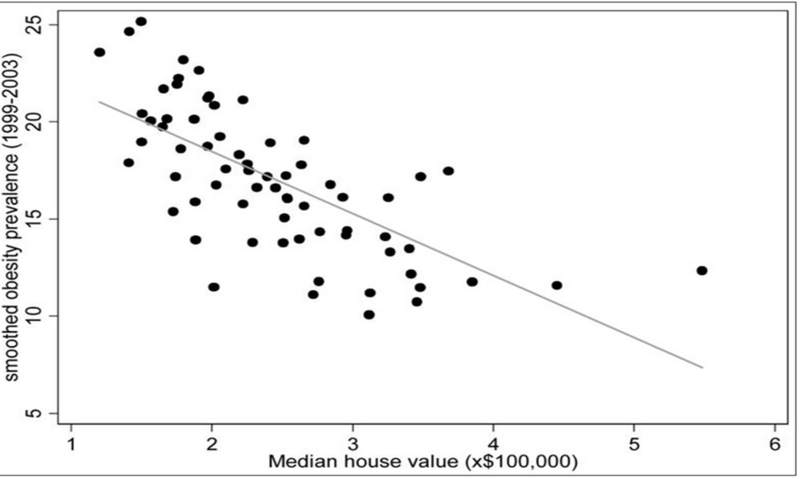 For example, Drewnowski et al (2007) found that obesity levels varied by ZIP codes in the greater Seattle area, and that this had a strong, inverse correlation with median house values (r2 = 0.46; p < 0.001), where poorer ZIP codes had higher obesity rates. Thus, neighborhoods and local conditions may provide more information than sweeping generalizations about entire countries, or even counties or cities. Still, the pattern is that in higher income countries, obesity rates are higher at lower levels of SES. Why should this be? Economic constraints and reduced food choice options preventing acquisition of more expensive, less energy-dense foods (fruits, vegetables, whole-grain cereals), and greater reliance on cheaper fatty and sugary foods, including sweetened drinks (Miech et al., 2006). ‘Food deserts.’ Farther distance from supermarkets with better food variety and fewer transportation options in poorer neighborhoods (Zenk et al., 2005). Overall decrease in leisure time and time for recreational exercise for adults (Monteiro et al., 2004). Lower levels of education and nutritional knowledge (Oh and Hong, 2003). Lower neighborhood safety and parental fear for child safety precluding outdoor exercise (Molnar et al., 2004). Skipping breakfast, and possible overeating at lunch and dinner (Miech et al., 2006). Possible cyclical binge eating when food is available in food insecure households (Basiotis and Lino, 2003). The above mechanisms are largely social and behavioral, but there may be another underappreciated link between poverty and obesity related to physiological changes early in life. There is an ever expanding scientific literature indicating that for a developing embryo or fetus, various stressors experienced by the mother (malnutrition, psychological stress, possibly oxygen deprivation from smoking) can have enduring deleterious effects on growth, development, and health. This falls under what has been called the developmental origins of health and disease hypothesis (Barker 1998). A few studies have found correlations between impaired prenatal development and excessive body fat (adiposity). In a study of 18-34 year-old Belgian males from 229 twin pairs (both mono- and di-zygotic), the twin who was lighter at birth was shorter and lighter as an adult, but had a higher sum of five skinfolds and waist-to-hip ratio, after adjusting for adult BMI (Loos et al 2001). This was true in both mono- and di-zygotic twin pairs, thus controlling for genetic factors, and the trend was more apparent as the birth weight difference increased between the heavier and lighter twin. The authors concluded that “an adverse intra-uterine environment, as measured by birth weight, is associated with more subcutaneous and abdominal fat and less lean body mass in adulthood.” Similar results have been found in experimental studies in other mammalian species (rats, guinea pigs, and sheep), where mothers given suboptimal diets had offspring with elevated adiposity (Budge et al 2005). From an evolutionary perspective, it has been hypothesized that offspring can ‘read’ nutritional or other signals coming from the mother which induce them to make long-term physiological adjustments such as investing in fat storage to deal with a shortage of nutrients in the outside world (Bateson et al 2004). These signals may not be limited to calories alone, but possibly to other more specific nutrients. Of course, in humans, suboptimal diets are more likely to be found in lower SES groups. Thus, it is entirely plausible (though not yet fully established) that at least some of the obesity burden among lower SES groups in the U.S. could stem from impaired maternal health and suboptimal prenatal conditions. The bottom line is that the poverty in higher income nations is about more than just trying to keep up with one’s neighbors. Our outside environments embed themselves in our biology, with measurable impacts on health and life expectancy. The relationship between poverty and obesity is vastly more complex than just personal choices or a matter of ‘gluttony’ or ‘sloth.’ It is true that we can make choices that affect our health, but poverty constrains those choices, and this may even begin when we are still in the womb (or even earlier). 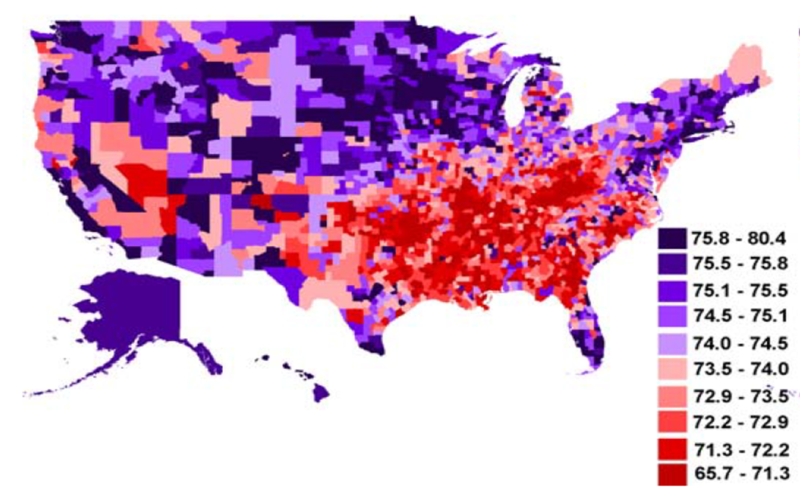 1) The ‘Eight Americas’ described by Murray et al (2006): Asians, northland low-income rural whites, Middle America, low-income whites in Appalachia and the Mississippi Valley, western Native Americans, black Middle America, low-income southern rural blacks, and high-risk urban blacks. Miech RA, Kumanyika SK, Stettler N et al (2006) Trends in the association of poverty with overweight among US adolescents, 1971-2004. JAMA 295: 2385-93. Molnar BE, Gortmaker SL, Bull FC Buka SL (2004) Unsafe to play? Neighborhood disorder and lack of safety predict reduced physical activity among urban children and adolescents. Am J Health Promot 18: 378-86. This entry was posted in anthropology, DOHaD, Fetal origins, Health Disparities, Human biology, Life expectancy, Life History Theory, Nutrition, Obesity, Population Health, Poverty, Stress. Bookmark the permalink. The concept that Sachs is summoning here is that of ‘relative poverty’ (see this site : http://www.poverty.org.uk/summary/social%20exclusion.shtml). He glosses it quite negatively in the interview you link to, but there are other, less loaded ways of seeing it – you might check out what Peter Townsend has had to say about this over the years. A short but invigorating read is Runciman’s ‘Relative Deprivation and Social Justice’; at the time he did the research for this book, in the 1960s, people in the UK tended not to react negatively to wide disparities in income and wealth, because they took as their ‘reference groups’ others who were in a similar situation to themselves, who were their neighbours, or who had similar jobs (bus drivers would compare themselves with train drivers rather than doctors). Today, it may be that media display of the lives (fictional or real) of the rich and famous, has increased exposure to more socially distant reference groups. However, as you rightly point out, relative deprivation is not simply a case of who you look to when you ask yourself how well you’re doing. Restricted access to goods and services that the majority take for granted can be socially crippling in many ways. Dismissing those who point this out as “envious” is really beside the point. Hi Timothy, thanks for the link and reading suggestion. I agree the idea of ‘relative poverty’ is much more useful than the term poverty of jealousy, and felt somewhat uneasy writing about Sachs’ phrase in that way, which is why I immediately defended him. But his terms were so rhetorically useful because they sound exactly like what’s emanating from certain corners of the media. You’re right that relative poverty can be crippling, and has real impacts on human lives and health. That should probably be the main point. Much appreciated. Great post, Patrick, excellent example of intertwining blogging and scholarship, the importance of biological anthropology and a holistic perspective for contemporary issues. A couple ideas. First, Sach’s distinction between two poverties is reminiscent of a deep history of people trying to distinguish “true needs” from false needs or consumption desires, or absolute versus relative need. One good source to track the history of these distinctions is Elizabeth Chin’s Purchasing Power: Black Kids and American Consumer Culture, which is also very accessible for undergraduates. Chin shows this absolute/relative distinction leads us down an impossible rabbit hole–the delineation of absolute need is shaped by the powerful, and leads to depictions of the poor similar to the examples you depict here. Thanks for the kind words. I’ve not read Chin’s book, but can definitely see how tricky it would be to clearly separate true needs from superfluous ones. I think the Wilkinson lecture touches on this, showing that we do not live in a vacuum (as obligatorily social primates) and that absolute GNP/capita in developed economies is limited in what it can predict about health and social dysfunction compared to measures of (in)equality. Lance’s article is a very important one because it argues that race is a *process* of life experiences leading to different biological outcomes, and not as simply a matter of innate/genetic differences. I think David Barker’s developmental origins of health and disease hypothesis (DOHaD) speaks to this nicely because it illustrates the power of early life events to have such long-term consequences. The effect poverty has on levels of obesity is often understated and I am glad to read about it here. In the past, the staple foods of the poor were foods like barley and beans. 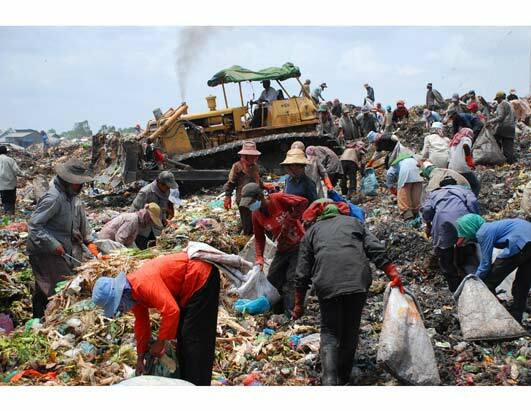 (They still are in many parts of the developing world.) In additition in times past many people may have been able to supplement these foods with fresh fruits and vegetables grown in their own gardens. Today,in contrast, these staple foods may not be readily available and fewer people have space for even minimal gardening. The result is a reliance on processed food,high in sodium,fat, and calories,but low on nutrition. The solutions to this problem will have to be multi-facted but the first step is to bring the problen to light,as is being done here. There is merely evidence that inequality (i.e., low relative income) and obesity correlate, not that inequality causes obesity. It’s also hard to see how that would happen, given that today’s low income populations are far better off than those of 50 years ago in an absolute sense, yet have far higher obesity rates. A far more likely explanation is that people who make poor choices about jobs and education also make poor choices about nutrition. In that case, attempts to reduce inequality won’t help improve health, they may actually hurt. I think reducing complex phenomena like opportunities for occupation and education, or health disparities to simply being a matter of choice is pretty far off the mark.